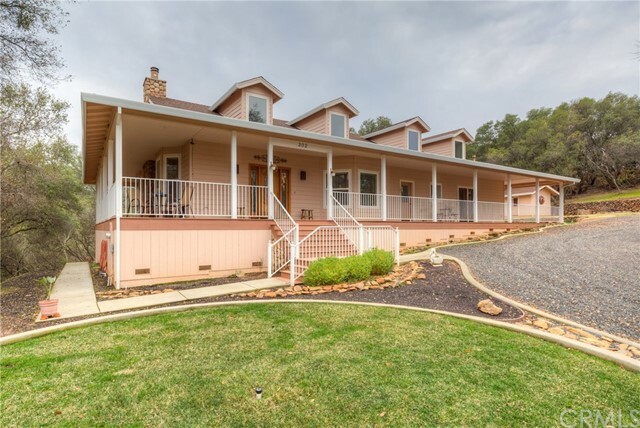 This beautiful country inspired home has a wrap around deck & sits atop the hill overlooking the rolling foothills out toward Lake Oroville. The gated property is located just off the beaten path of HWY 70 & is a quick jaunt into Oroville, Chico & Paradise. Upon arrival to this preserved 11.96 acre piece of land you'll notice the shared driveway with the neighbor who also has a custom home. Simply imagine sitting on the covered porch as you watch the sunset over the hills, the sound of the train ever so peaceful off in the distance as the thought of love life passes your mind. A surreal setting for such a beautiful home with dormer style skylights that flood the entire home with natural daylight from sunrise to sunset. From the tiled floors to the soaring ceilings, your eyes have so much to take in. But wait, you will find so much more to love in the custom kitchen. From the custom oak cabinets, the sparkling granite counters & the high end Viking stainless gas cooktop that's ever so complimented by the Kitchen Aid sub-zero refrigerator. Each of the bedrooms have french doors out to the patio & one of the spare rooms with it's own gas fireplace. The master suite is sure to impress with a gas fireplace, huge closet and soaking tub with views of your private land. Outside the wrap around porch you will find a stamped concrete patio that then leads to the 1,120 SQFT garage. This stunning property won't last, call today!